Before I start, I'd say that I've done enough research for the problem, and I had also raised a case in the past with Microsoft Support to come to a conclusion for this problem. This time, the problem is with an unexpected twist. -> Error 17-07-2018 12:29:39 Windows Server Update Services 10032 7 The server is failing to download some updates. -> Error 17-07-2018 00:14:26 Windows Server Update Services 364 2 Content file download failed. Reason: The server does not support the necessary HTTP protocol. Background Intelligent Transfer Service (BITS) requires that the server support the Range protocol header. // taken Microsoft Support in the past to identify the problem was some setting of the proxy appliance. The strange part for me is I'm not able to understand why the download status is shown as complete, given that the update themselves are individually failing. I've repeatedly tried, but the effort has been in vain. My Observations: In the past we had the problem that WSUS was entirely failing to download update, and even the downloaded status was zero. At that time, we took Microsoft Support and came to the conclusion that there is a setting in our proxy which has scanning feature of antivirus and anti-malware engine, because of which the downloading of patches takes significant time or the session is getting terminated. OEM of proxy confirmed that "a file that is large and dense, such as a 200MB ZIP file containing software developer tools, etc. can take 30+ minutes to be fully scanned by the anti-virus/anti-malware engine." The case was closed after we excluded the Windows update URL from the scanning feature of proxy, and the updates were downloaded successfully in the WSUS. Unfortunately, this time the case is same, except that the patches are shown as downloaded in the WSUS dashboard, but individually shows as failed in the update view. We've confirmed from the proxy that this scanning of the package setting has been enabled permanently, and are not ready to change without a proper justification. They have asked us to check as to why this peculiar behaviour is depicted in WSUS. 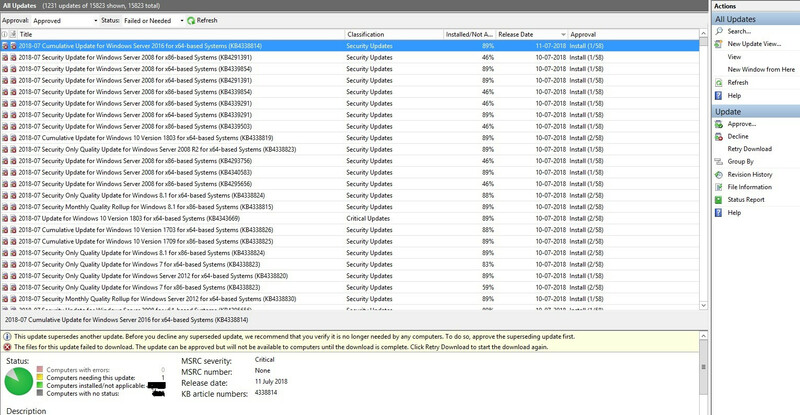 Can someone explain why WSUS is showing dual behaviour of patch download status? I've checked that the WSUSContent (E:\WSUS\WsusContent) is not showing any recently downloaded updates. If I try the same from browser on the WSUS Server, the file takes too long to download. But, it does complete the dialog from the browser for the same URl. Unfortunately, it seems that there is some timeout value for WSUS which doesn't take care to wait till the proxy appliance scans the entire package. Is there anyway I can force it to wait to download patches? Why the session is maintained in the browser to download the entire package, but not in WSUS to download the same update? Thank you for going through the entire question. If any further detail is required, please let me know. If you can contribute / suggest anything towards the problem, I am all ears. For your proxy download issue you could try to running BITS in foreground mode. This will re-scan for files that require downloading. Not the answer you're looking for? Browse other questions tagged proxy wsus windows-update or ask your own question. How do I disable WSUS for a single server? Why is Windows Update suddenly failing with error 0x80244019? How can I assess the impact of WSUS updates before releasing them?